This step by step diy project is about building deck railings. Building wooden rails for your deck is necessary, especially if it is more than 30″ from the ground. In addition, you shouldn’t let more than 4″ between the balusters, as to prevent a child from getting trough them. You could fit the posts into concrete or you could attach them directly to the deck framing. Irrespective of your choice, make sure you comply with the legal codes. 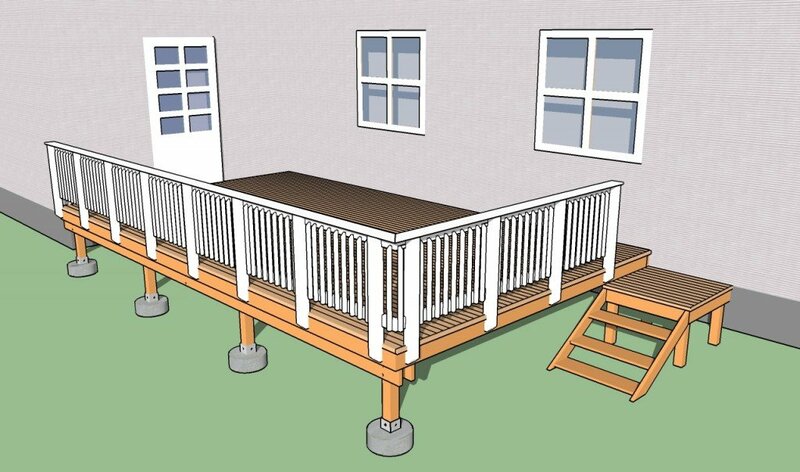 There are many things you should take into account before starting the construction of the deck railings. First of all, you need to read the local building codes, as they are many legal requirements you have to comply with. Afterwards, plans everything with good judgement, making sure you place the posts and the balusters equally spaced. Read the codes to get the an idea about the distance you should let between the components. In addition, we recommend you to buy quality lumber that is also weather-resistant, such as pressure-treated lumber, pine, redwood or cedar. Select the lumber with great attention, making sure the components are perfectly straight and in a good visual condition. Round the exposed edges of the railings, if you want to add character to your woodworking project. 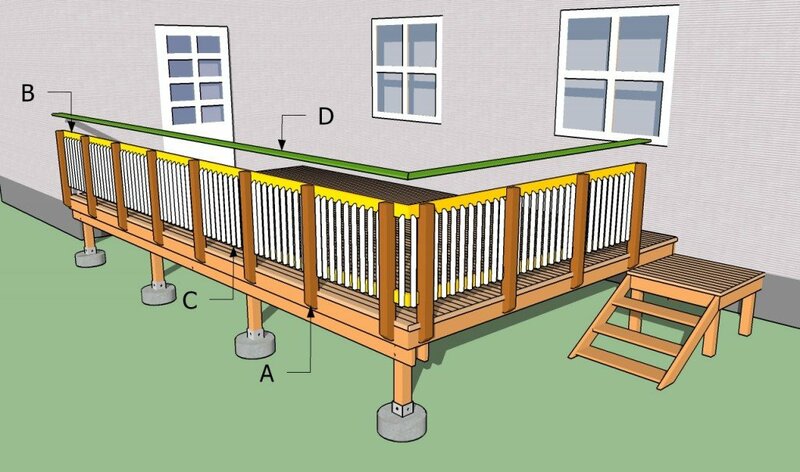 Smart Tip: Building deck railings is a complex project, but any person with basic woodworking skills can get the job done, if the building codes are followed and the right plans are used. Plan everything form the very beginning and make the necessary adjustments to fit your needs. The first step of the project is to build the wooden posts. As you can see in the image, you need to cut 1 1/2″ notches inside the posts, otherwise you won’t be able to fit the rails properly. Make parallel cuts inside the marked areas and remove the recess with a chisel. Usually the decks rails are 36″, including the top trims (3/4″ thick). In addition, leave about 3″ from the decking to the bottom rail. Continue the project by installing the posts to the deck framing. As you can easily notice in the image, you need to drill several pilot holes trough the posts and insert lag screws, if you want to get a rigid structure. In addition, we recommend you to plumb the posts with a spirit level, otherwise you won’t get a professional result. Place the posts equally spaced, leaving about 35″ between them, according to the configuration of your deck. Continue the woodworking project by installing the rails into place. As you can see in the image, you need to fit the 2×4 lumber inside the notches and lock them together to the posts with 2 1/2″ galvanized screws. Drilling pilot holes is important, as to prevent the wood from splitting. Use a router and a 3/4″ bit to round the exposed edges of the rails. Check if the rails are level using a spirit level. Cut the end of the rails at 45 degrees, if you need two join two perpendicular components. Add waterproof wood glue and insert several 2 1/2″ screws to lock the rails together tightly. Work with attention and with great care, if you want to get a professional joints. The joints of the rails should be placed on a posts and not between them. Cut the components at 45 degrees, as to get a strong joint. Add glue and insert 2 1/2″ screws into the posts. Fitting the balusters is not difficult, especially if you have follow the instructions as describe din the project. Use 2×2 lumber to build the components. Align the balusters into place and drill pilot holes before inserting the galvanized screws. Place a small block of wood (2-3″ wide) between the balusters, if you want to get consistent gaps. Make sure you place the balusters equally spaced, in order to get a nice appearance. One of the last steps of the project is to attach the trims on the top rails. Cut the ends of the trims at 45º, as to join together easily. Secure the trims to the rails and posts with 1 1/4″ finishing nails. Smart Tip: Fitting the trims is not compulsory, but it will most certainly add value to your project. Round the exposed edges with a router and add glue to the joints, if you want to get a professional result. Last but not least, we recommend you to take care of the finishing touches. Fill the holes with wood filler and let it to dry out for several hours. Afterwards, smooth the wooden surface with fine-grit sandpaper. Smart Tip: Apply several coats of stain or paint to the wooden components, if you want to protect them from decay and to enhance the look of your deck railings. Thank you for reading our project about building deck railings and we recommend you to check out the rest of the projects. Don’t forget to share our projects with your friends, by using the social media widgets.